I finished up the Terminator Assault Squad and a pair of Rhinos the other day as part of my ongoing commission. I've started work on the Land Raider Redeemer but I've still got a ways to go on it... freehand. For some reason, the whole Terminator squad photo wouldn't load up so I cropped a small section with just two guys to show you what they look like. They still need static grass on their bases yet. I never realised how cool looking the big tactical arrows are on top of Rhinos until I painted this one up. I'm adding them to mine if I ever get the chance for sure. 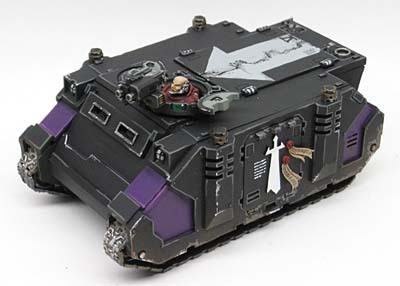 UPDATE: Here's the link to freehanding the arrow on the Rhino. Did you freehand the Arrow or did you mask it up first to get the shape? Those look really good. I'm getting that itch to go home and paint now. Motivation for the win! 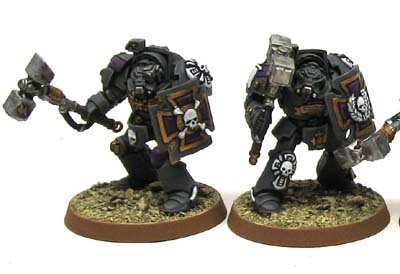 Also, are they sculpted Chapter icons i see on them terminators? one more thing, when painting tanks how do you avoid seeing brushstrokes over large flat areas? That seems to be the bane of my existence right about now. I'm just about to go out and buy an airbrush! Toxin616: The arrows are just freehanded on there. I drew out a quick outline but there's no real trick to them. I should have taken a picture but I didn't think anyone would ask about them. As for the Chapter icons, they're sculpted on there. They're actually bits of plasticard to provide a little relief for the side of the model. As for getting rid of brush strokes, that's a bit harder. The LRR I'm working on now is grey and I'm having to "remove" them. For me, it's a matter of adding additional watered down coats over the larger surface areas to "fill in" imperfections. I'll post pics of it when it's done too. Excellent as always.. but super quick speed Ron! It took eons for my Relictor Termies. That arrow is awesome, is there any trick to making it that neat? Siph_Horridus: Look for an update on them in the next few days. Double sided banners are a monster all to themsleves. The results can be great but it takes some planning on the front end so it works out. I'd love to help you guys out too, just let me know. Master Darksol: Thanks, so far he's really excited to get them and I'm hoping to make his wait as short as possible. Gavin: I can post something in the next day or so showing you how I did it if you want. It takes nothing at all to do really. Your a champ as per usual! Seeing all this great work makes me want to paint.